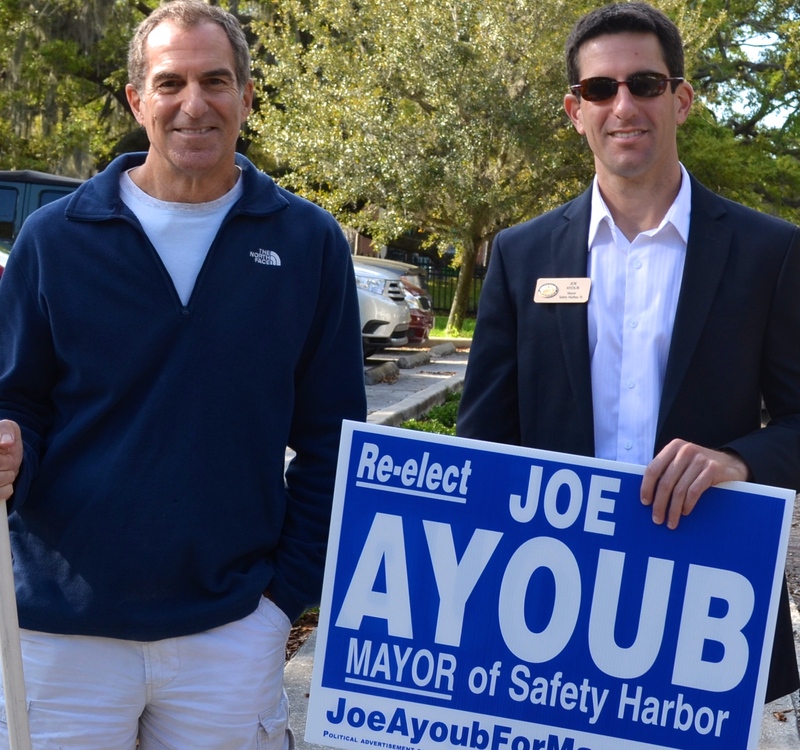 Former Safety Harbor mayor and city commissioner Joe Ayoub recently announced he will run for mayor again in the upcoming municipal election on March 14, 2017. The national election ended less than a week ago, but here in Safety Harbor, the local campaign season is just starting to heat up. 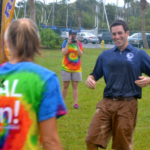 The city’s municipal election is slated for March 14, and a name that’s very familiar to residents will appear on the ballot, as former Safety Harbor mayor and city commissioner Joe Ayoub recently declared his intention to run for mayor again in 2017. “I’m excited,” Ayoub, who was Safety Harbor’s mayor in 2013-14 and served as a city commissioner from 2007-2013, told Safety Harbor Connect on Monday. 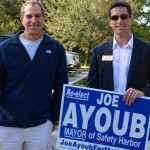 Joe Ayoub and his dad, Steve, campaigning during Safety Harbor’s 2014 municipal election; Ayoub would go on to lose a close mayoral race to Andy Steingold. Ayoub, who suffered close losses in the past two municipal elections, including a defeat by less than 100 votes to current Mayor Andy Steingold in 2014, said he was encouraged to run again after witnessing a number of key issues divide residents of the city over the past several years. Ayoub, 40, said he plans to conduct a campaign based on listening and communicating with voters, which is one the main reasons he announced his candidacy so early. 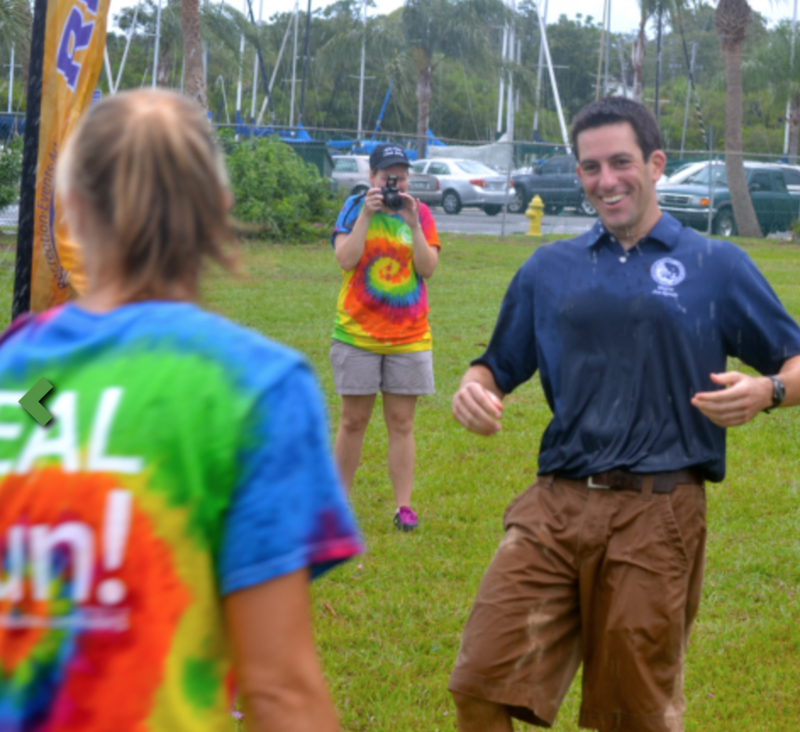 Then-mayor Joe Ayoub unsuccessfully tried to dodge a water balloon during the opening of Safety Harbor’s Waterfront Park in June 2013. Ayoub said he learned valuable lessons from his prior campaigns that he intends to utilize this time. 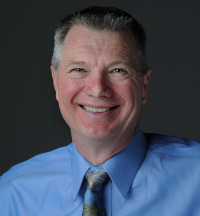 The longtime CPA, who is currently the CFO of a technology solutions company, said he isn’t going to let past election day disappointments affect his plans for the future. “I’m not running against anyone. I’m running for mayor of Safety Harbor. The 2017 Safety Harbor municipal election is scheduled for Tuesday, March 14. Two seats will be up for grabs: Mayor Andy Steingold’s, and Carlos Diaz’s Seat #4. The candidate qualifying period for both races begins at noon on Jan. 3, 2017, and it closes at noon on Jan. 10. 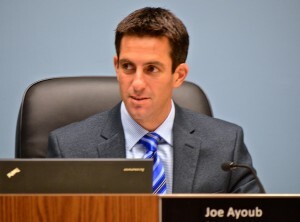 For more information on Joe Ayoub’s mayoral campaign, visit his website at joeayoubformayor.com. Note: An earlier edition of this article stated Ayoub’s age as 39. It has been amending to show his correct age. Great decision. Safety Harbor needs you, Joe. In an effort to set the record straight regarding the false accusation posted on Joe Ayoub’s Facebook page concerning my involvement in “sign gate”, I discovered I was blocked from commenting. For the record, I did not file a code enforcement complaint about his signs with the City. I received the same information regarding the rules and regulations as he did and chose to follow them. I cannot trust you to handle the the business affairs of his city while you have mishandled your own personal finances in the past. You are a carpetbagger and an opportunist and part of everything that is wrong with local politics in Safety Harbor. Steven, A huge problem I have with Janet Hooper as as elected official is that she does not own property or pay any property taxes in Safety Harbor. So she’s voting on issues that will affect home owners while having no skin in the game. But what is your reference to her mishandled personal finances? Are there more issues? Bank of America was forced to litigate against her becuase she stopped paying her mortgage. I’m not aware of any gaps in employment on her part (validated with Linkdin) – it is my belief she chose pupsoelfully not to meet her financial obligation, despite entering into a business contract. I am deeply troubled when those who want to lead us treat contractual obligations as a manner of convenience versus a priority. If all contractual obligations and promises could be broken just because of the entity with which we do business – out entire economic system would fall apart. Mortgage or not, bank or not….an obligation was not honored. Litigation is a common theme with her supports. Did you know Sharon Schellenberg (Saving Safety Harbor) was reviled in her former town of Rochester, Michigan? Not only becuase of her constant litigation efforts to avoid paying her fair share of taxes, but also becuase she nearly bankrupted the The local Elk’s Lodge in that area with a nuisance lawsuit. She claimed gender discrimination, but even after she won membership – never stepped foot in the lodge. She like to think of herself as a bear – but she’s just a bully. Her business took a major financial hit and in the 90’s, she was a villain in the local media. I’m sure this had some small part in her decision to relocate to Florida….only to repeat the same pattern of bullying behavior. I did some Google and found that Sharonand her husband got a legal SMACKDOWN in the Michigan Supreme Court. If you know legalize – then you can read this and understand how embarrassing this lost was. Hey “No Name Steven”! LOL – you have been honored to be on Saving Safety Harbor’s Facebook page!!! Typical of this page, degrading you for no last name when the authors of Saving Safety Harbor are Shelly Schellenberg (Code Enforcement board) and David Riggle (Planning & Zoning Board). Love how they demand others to “Identify Yourselves” when they themselves NEVER sign their names and seem to get great pleasure vilifying Safety Harbor citizens that even slightly disagree with them and their views. I see you were called a racist and against women’s rights because God forbid you are not voting for their candidate! Typical. Well, all I can say is welcome aboard buddy, it is good to have you on the Schittenberg list with us. The numbers are growing and I have a feeling more will be joining us since more and more citizens are coming to realize who hides behind this page and how they treat fellow neighbors and citizens. Janet, Just so you are aware of what your friends (Shelley Schellenberg and Don Riggles) who hide behind their “Saving Safety Harbor Facebook” do to individuals. They write nasty comments about others on their created facebook page called “Saving Safety Harbor” and then block these same individuals from it so they cannot comment. Please talk to your friends, Shelley and Don (who are also on elected boards in the city of Safety Harbor) to please stop this negative and nasty nonsense already. Individuals who serve on boards in this city should have to follow ethical standards. I have previously spoke to Mayor Andy Steingold about the inappropriate behaviors from these two individuals and have included Matt Spoor in emails as well. Since they are your friends, maybe you can assist with stopping this inappropriate comments. Thank you. If you look up Shelley and Riggles in Rochester, MI….you’ll se all they do is sue and litigate against local city and county governments. It is AMAZING that they have been allowed to continue to serve not only because of their past difficulties in Michigan, but becuase of their behavior in both in public hearings and on social media. The most divisive, belligerent and hate-filled voice in Safety Harbor is the “Saving Safety Harbor” Facebook page, a site that takes pride in using insults, intimidation and threats against citizens to promote its agenda. Even worse, its repulsive attacks are condoned — even supported — by elected officials of the Safety Harbor City Commission, including Janet Hooper. Remember, it was supporters of “Saving Safety Harbor” who took pride in opposing the new Iron Age Homes project by “welcoming” a new family moving into town with such vile insults and taunts that the woman and her 80-plus year-old mother were left in tears. “Saving Safety Harbor” is operated by Shelly Schellenberg and her husband David Riggle. Its chief supporter is Sharon McAuley. Schellenberg and McAuley serve on the Safety Harbor Code Enforcement Board. Riggle is on the city’s Planning and Zoning Committee. Thus, empowered by positions of influence granted by elected city officials , they operate a Facebook page that pushes hate, half-truths, lies and insults in an effort to discredit and intimidate those voicing a opposing view. If you have ever in your life disagreed with Schellenberg’s message of hate, how do you feel about one day you needing to mediate a zoning issue or requesting a variance from Planning and Zoning? Does this thought leave anybody else with a bad taste? Like you just threw up in your own mouth? Before last year’s election, Mayor Andy Steingold admitted having once asked Schellenberg to step away from his campaign because of her unattractive behavior. However, as soon as the election was decided — Hooper and Andy Zodrow winning seats — it was time to pay up for dirty deeds done. Despite a long list of complaints by citizens filed with the city against Schellenberg, she was re-appointed to a second term on Code Enforcement, while Riggle and McAuley were added as new members to their respective boards. Making all this even worse is the fact that “Saving Safety Harbor” is more one-sided than a school-play backdrop. Never is there an opposing view seen on SSH; Schellenberg does not allow it. Any opposing opinion or criticism that is posted on the page, is immediately removed and the offending author is blocked from future comments. Prove you want to be a leader of all people in Safety Harbor. Prove you want to repair a quickly widening divide between two sides and not relish the idea of pitting neighbor against neighbor. I challenge ALL CANDIDATES to condemn and disavow Saving Safety Harbor and the ugly messages it promotes. Defending vile hate, and using its voice for benefit is repulsive. The only thing worse is rewarding it with appointments to positions of influence in our city government. We’re looking forward to a progressive Safety Harbor, overseen by Mayor Joe Ayoub. Fewer empty buildings on Main Street. A more inviting atmosphere for businesses. It’s time for “Mayberry” to come into the 21st century. We need to support this town before it dies. Riddle me this Joe Ayoub supporters. Why would he sign in at the Mayor’s breakfast as being from Oldsmar and not Safety Harbor, where he resides, and is running for mayor? By doing so, his money goes to support the Upper Tampa Bay Chamber and not Safety Harbor’s Mattie’s Kids. Why wouldn’t he support the city of Safety Harbor and it’s children? If he doesn’t even support our children, how can we trust him to support our city and the residents best interests? No, I am not using my real name for fear of retribution, bashing, and a possible lawsuit. I see what has been said here, and it’s mean spirited, and hurtful. I do not wish to be a recipient of that type of treatment. I am only asking a simple question that doesn’t require anyone responding with negativity and unkind words. The Heaet and soul of the Mattie Williams center passed away a few years ago (Mattie), that charity is a shadow of it’s former self. That wouldn’t be my first choice either when it comes to charity. The principle on record (Janet Hooper) has has enough personal financial litigation issues that I wouldn’t trust any charity she runs. I can understand why Joe would support a different charity. Is there only the one charity in Safety Harbor? Why are all charitable events for the Mattie Williams Center? “Riddle me this” comments a lot on Saving Safety Harbor too, so we have a good idea who you are. And no one is being mean spirited but your friend Shelly Schellenberg. At least on this site there can be a two way conversation. And we comment back with humor, no fun being hateful. Wasted energy. Who said Joe doesn’t support the Mattie Williams Center or children in Safety Harbor? Also, Mattie Williams Center helps children in Oldsmar & Clearwater, not just Safety Harbor. To say he does not support the children or what the Mattie Williams Center offers our community is not right. I was just on saving SH. Can someone tell me if I am living in the twilight zone. How can someone who is on the city board be allowed to run such a hate filled page? It should not be allowed and the rest of the commissioners and mayor should be ashamed to allow this to happen and speak to them, actually they should be made to resign . I do not know if it is possible but Joe Ayoub should file a suit for slander and harassment. The two of you are bullies, there is no other word for it. Do you think anyone will want to move to SH after seeing such non-sense from grown adults? You are helping to scare people away. If you love trees so much when a lot comes for sale with trees on it go ahead and buy it and not do any building. Better yet donate some money to the city to plant trees at the waterfront park, it is nothing but a bunch of grass. No you just want to bully people who innocently buy homes and had no idea all this was going on. Did you know that the developer on Iron Age had to pay a lot of money into the tree bank? Can someone tell me where the new trees are planted from that money? I am just curious. I know the city commissioners read this page and saving SH so why dont you do something about this craziness. They are just as guilty for allowing this to happen. I just cant believe what I am reading. Shame on all of you for allowing this to continue. Jokes on you….Mattie Williams center also serves children of Oldsmar per my conversation with Janet Hooper. She actually advised me that less than 50% of the people served at Mattie Williams are from safety Harbor although that may have changed as of late. Prior to Jane Hooper sitting on the commission board, the previous commission had discussed changing how charities received their donation from the City which received a lot of push back from Janet Hooper. She actually did tell her voters when running from commission that she would step aside and then did not. I do not like being played do you? Thank you Batman for not being harsh with your response. However, this isn’t about Janet Hooper, but the children and community that benefit from donations of all kinds. The Mattie Williams Neighborhood Family Center has been helping families since 1994. 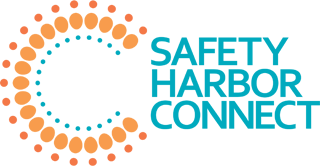 Our mission is to nurture and strengthen children, youth, adults, families and communities through education, support services and collaborative partnerships to help people improve their lives and achieve self-sufficiency. The Center is governed by a board of directors, not Janet Hooper, and her personal financial situation has no bearing on her ability to perform her job, be an affective commissioner or run for mayor. Does anyone besides Janet even know all the facts and truth other than what you can Google? Steven was very presumptuous by saying what he did. He has no clue, nor do I about her personal finances other than what you might find on Google. What would Google tell me if I searched on Joe? I am just saying, be fair, know the ALL the facts before throwing personal information out here. Judging her on a past financial situation without knowing all the facts and circumstances seems unfair. She is not running a charity, but overseeing a center that strives to provide assistance for those in need, and for that she is highly qualified. We do agree on one thing and that is the loss of Mattie Williams. She was one special lady. I didn’t say he didn’t support, I said why wouldn’t he? When the money goes to the UTBC it does not help Mattie’s Kids, that was my point. On the other hand, of course he has the right to decided where his money goes. It’s just too bad that people can’t seem to separate Janet Hooper from Mattie Williams. There are not synonymous. Its not about her when fundraising, it’s about the kids and all the Center does. Even if you don’t care for her personally, does not mean you can’t support the Center. The children and community suffer when there is a lack of funding, not Janet. As far as mean spirited, comments by Steven, on more than one occasion, have been very mean spirited. Calling Janet Hooper a carpetbagger is by no means a compliment. To Riddler – Your statement “Why wouldn’t he support the city of Safety Harbor and it’s children? If he doesn’t even support our children, how can we trust him to support our city and the residents best interests?” You have implied Joe is not supporting the children of SH. Very broad statement. There are so many ways a person can support SH children, the city and the residents. And yes Janet Hooper and Mattie Williams is synonymous. She may be a fine director but the center receives tax funds voted on by the city commissioners for the center so there is a direct connection. Wow, what a negative, nasty site this is – it seems everyone is rude, childish and vengeful. Where is the adult in the room. I don’t know a lot about the Mattie Williams Center, but I do know that a lot of people in the community benefit from it and need and use the things that are donated there. So are we bashing the needy as well.